You would have seen on my Snapchat and twitter about my latest outing to JCB for a hair treatment service. I have been to JCB some two weeks back for a Cysteine treatment. If you recall, I had a partial cysteine treatment done on my hairs this January by Juice Salon and it was a good experience. 4) The Process: Smoothing process esp the one that I had, goes for 3 hours. It starts from hair wash followed by blast dry. Then the cream is applied on your hair and kept for 30 minutes before the rinse. Rinse is followed by another blast dry and hot ironing that lasts 30-40 minutes. Post which, a neutralizer is applied on your hair [from scalp] to close the pores. Keep the neutralizer on hair for almost 10 minutes. Post 10 minutes, go for rinse and blast dry using a paddle brush. The look is finished with leave-in serum. 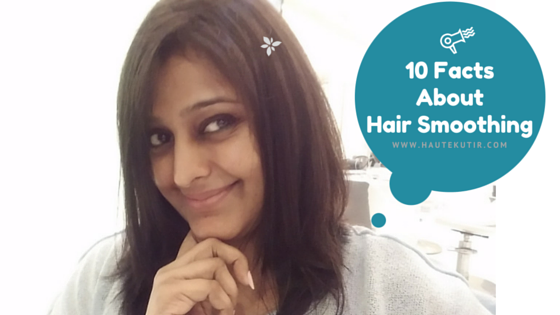 5) Cost: Hair Smoothing costs starts from INR 3000 to INR 10000 depending upon your hair length. I have shoulder length hair and JCB charged me Rs 8000 plus taxes [sob sob]. However, you can try some other local salons that charge lesser say around Rs 4k-5k for the same. 6) Risks and Side Effects: They are chemically loaded and some products contain formaldehyde. You need to check the products for chemical composition. Your stylist may say that it is "free of formaldehyde" but it may not be. Formaldehyde is more of gas that contains methylene glycol, formalin, methanal, and methanediol—ingredients that release formaldehyde when heated or mixed with water. It is more risk to the people who work with it than you and hence exposures needs to be limited. Since salon treatments don't require FDA approval, you need to do your own due diligence if you want a formaldehyde-free service. We mentioned Formaldehyde above and an inclusion of it could cause nausea, headaches, teary eyes, skin rashes, throat, and nose irritations. I had nausea, severe headache and wheezing post this Wella Smoothing treatment at JCB that could also be accorded to weather change. This was a learning curve for me. 7) Post smoothing care: It is not a standalone treatment but requires due care including the duration of hair wash, oiling etc. It may be exhaustive and hence I will do a separate post on it. 8) No Major Loss in Volume: Unlike Cysteine, this process will just ease out your frizzy hair and make them softer and shinier. Except for the initial week when you hair may look flat post the treatment, they will come back to original volume post 2-3 washes, signifying the cut/waves that you may have. 9) The Frequency of the Treatment: You will indeed love your hair post-treatment and when it starts wearing off, you may feel the urge to re-do it. I am not saying do not do/repeat smoothing treatment. Do go for it but do not get it frequently. In my humble opinion, you should not do smoothing more than twice in a year. 10) Smoothing is an alternative, not a solution: A lot goes behind keeping your hair healthy . It can genetic, lifestyle, diet, fitness or so. Thinking that one treatment will solve all your hair problem is unfair. You need to substantiate your quest for good hair with a good diet, proper lifestyle and good level of hygiene. Anything chemical or unnatural, have their own side effects. If a cream can change the look of your hair, they will also have a changing impact on your hair cells. Sometimes smoothing can make your hair weaker and thinner. Well, that can hold true with hair products including shampoo, conditioner, serum and styling products. Hence, be careful and inquisitive about the treatment you are doing. Talk to your stylist and do follow a proper skin and hair care regime. Post smoothing, I am liking the way my hair is looking. They look more neat,sorted and manageable. Though I am recovering from my fever and cough post the treatment, I am not linking it totally to the treatment and giving it a benefit of doubt as of now. I am also facing some dandruff and hair fall issue but that is not the first time issues and can also be due to monsoon. Like I said, it is too early for me draw conclusions. Let me revel in with my hair and in meantime fix dandruff and hair fall issue. I will keep you posted on hair condition. Stay Tuned. Do try out hair smoothing treatment and let us know your experience. For any query/tips/collaborations, do write to us at hautekutir@gmail.com or tweet #AskEkta for any beauty/hair tips.